You know what I call a 440-yard par 4? A par 5. Actually, I don’t play many 440-yard par 4s anymore. I am playing it forward these days. The middle and forward tees are my friend, where those 440- or 450-yard holes are indeed par 5s. Call me crazy, but I like to stand on the tee thinking I have a fighting chance for a par, or maybe even a putt for a birdie. And that happens a whole lot more often when I am on a tee that is commensurate with my ability as a golfer, which I am afraid has been in decline for some time. For one fleeting summer, I boasted a single-digit -- high single-digit -- handicap. But it has now climbed to about 15 and the reality is I just don’t hit the ball as far as I once did. I find anything over about 6,200 or 6,300 yards -- especially here on the West Coast where the ball doesn’t fly as far in our heavy air -- is simply too much golf course for me. I begin to run into those long par 4s where I struggle to reach the green in regulation no matter how good a drive I hit. The United States Golf Association held a two-day innovation symposium in Vancouver earlier this spring and one of the featured speakers was a gentleman who is perhaps the biggest proponent of playing it forward. Arthur Little and his wife Jann Leeming bought Province Lake Golf Course in Parsonfield, Maine out of bankruptcy in 1996. Over a period of five years they rebuilt the course, installing new tees to make it more playable, especially for women and juniors. The course now has six sets of tees ranging from 1,998 yards to 6,336 yards. “We had quite a few women, a lot of senior men and not many juniors playing our course and we just concluded that the way the course was set up was frankly way too long for many of our players to make greens in regulation,” Little says. “So we completely rebuilt the tee system. During their nine-year ownership of the course, play increased 150 per cent and women’s play increased from 15 per cent to 35 per cent. Little and other play it forward proponents say swing speed and distance should determine where you tee it up. Little says the average female golfer hits her drive about 140 yards, while the average male player hits his about 210 yards. 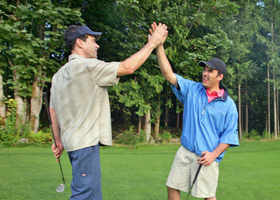 He suggests a good rule of thumb when selecting what tee to play from is to multiply your average drive by 30. So that means a woman hitting it 140 yards should be playing a 4,200-yard course if she is to stand a chance of hitting greens in regulation. Trouble is, there aren’t many courses offering a tee of that length. Typically, forward tees on most courses range from 5,000 to 5,500 yards. With Little’s help, more courses are starting to recognize the need to move their forward tees forward. Little has established a foundation called the Royal Little Family Foundation that provides the golf industry with data and guidance concerning the placement of tees and other course set-up concepts. Mike Keiser, the owner of Bandon Dunes, has adopted Little’s principles to re-make the tees at the southern Oregon coast resort. Golf architect Bruce Charlton, who appeared with Little at the USGA symposium, said it’s all about making the game fun. “You need to get players into a position off the tee where they have a chance to succeed and have fun,” Charlton says. “What this is telling me is that we need to think a lot further forward than the norm. Having fun while playing golf. I am all for that. Article by Guest Contributor Brad Ziemer, as featured in the May 2017 edition of the GolfBC eNews.